Are you one of those people who can’t stand waking up to morning breath? There’s a good chance that you brush your teeth first thing when you get out of bed. But then you probably go on to eat your breakfast, right? Many people don’t like eating breakfast with a toothpaste flavor in their mouth, and they feel like it makes more sense to brush after you eat. It’s an argument that has divided many households, and it may even be something you’re confused about. When you go to sleep, your mouth slows down just like the rest of your body. This means that your saliva production also slows down – to just 10 or 15 percent of its regular capacity overnight. In order for your teeth and gums to remain clean and healthy, you need to have the proper amount of saliva flowing throughout your mouth. If you don’t, your teeth and gums are more susceptible to decay and infection. When your mouth dries out considerably like it does when you are sleeping, bacteria take advantage of the atmosphere which is easier for them to breed in. This is one reason that your breath might stink in the morning when you wake up. Those bacteria can be pretty nasty and create some surprisingly funky odors. This can be made especially worse if you eat sugar at night, because bacteria are known to feed on it and reproduce even faster. So, should you get rid of these bacteria as soon as possible after you wake up? There’s nothing that really says you’ll be any worse off after you eat breakfast, according to dentists. It really comes down to personal preference. If you simply can’t stand the filmy, dry mouth feeling, you may be better off brushing when you wake up. The increased saliva production might even help you enjoy your breakfast more. However, if you don’t like the taste of toothpaste mixed with your breakfast, there is no inherent harm in waiting until after your meal to clean up. The most important part is that you at least brush afterwards so that you can break up the bacteria that has been growing overnight. The good news is that eating breakfast can help assist with this process as it will introduce new saliva and help to move the bacteria off of your teeth and gums. 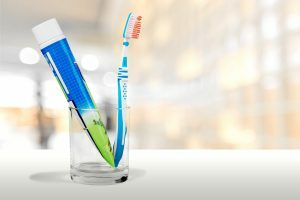 Whether you brush your teeth before or after your meal is up to you, and as long as you do one or the other, you will be doing your mouth a favor and keeping your teeth healthy. Even more important is to remember to brush your teeth at least 2 times a day. To learn more about properly caring for your teeth, book an appointment today with Alla Agamov, DMD.